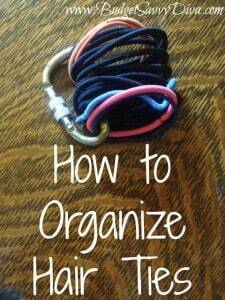 Here is a great list of ways to organize hair accessories. 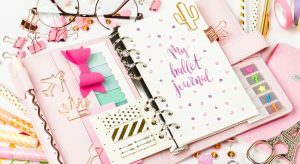 The list includes both tucking the accessories away in a drawer or a bag and options for prominently displaying all the cuteness! Whether you have one daughter or three, hair accessories can accumulate quickly, and they tend to disappear just as quickly! When they are organized and easy to find, it simplifies your morning. There’s no running around looking for the brush or that favorite pink barrette! 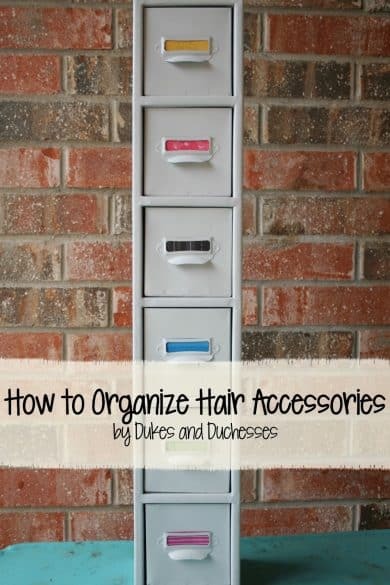 Here is a great list of ways to organize hair accessories. 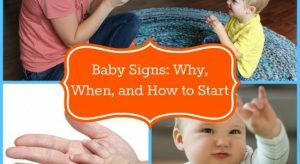 The list includes both tucking the accessories away in a drawer or a bag and options for prominently displaying all the cuteness! This board, made by Vanilla Spring Design, is a beautiful way to display all your girls’ hair accessories. She gives a detailed tutorial so you can make one of your own! 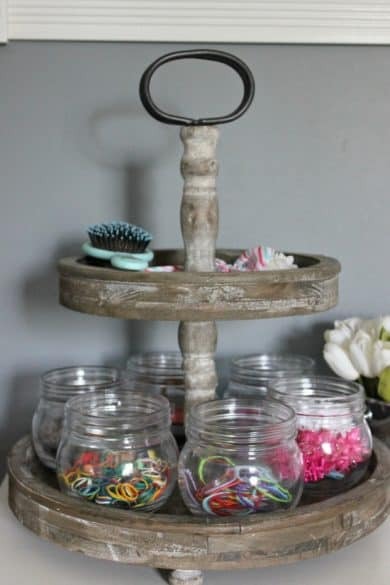 This is another beautiful way to keep all the hair accessories on display. Not only is it striking, it’s also easy to access all the bows, barrettes, and hair ties! 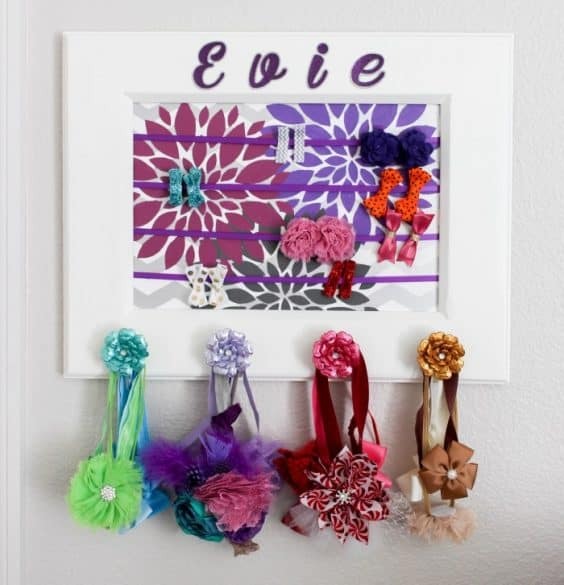 If your daughter has lots of headbands, this is a cute, inexpensive way to store them all. 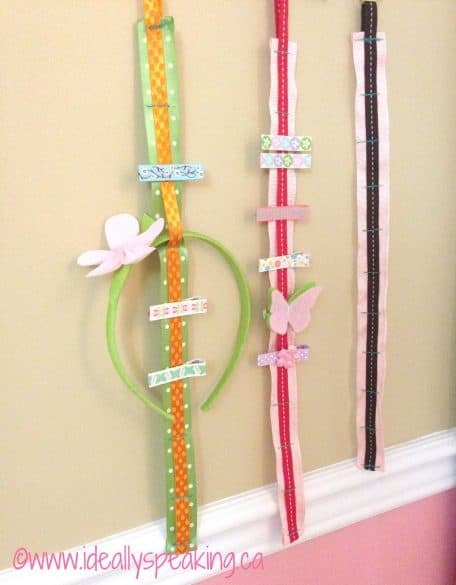 Use ribbons to display both headbands and barrettes. 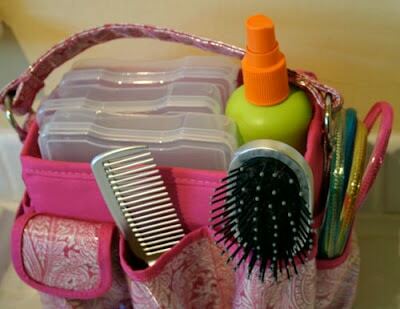 If your daughter uses lots of bobby pins (think dance recital season!) 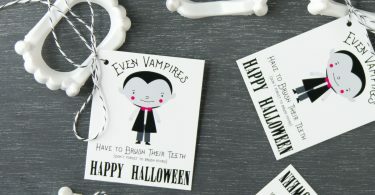 consider using magnets to keep all the pins together. 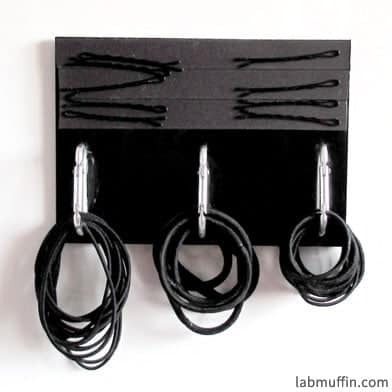 Add some clips to hold onto hair ties as well! A carabiner is a simple way to keep track of all the hair ties that tend to go missing. 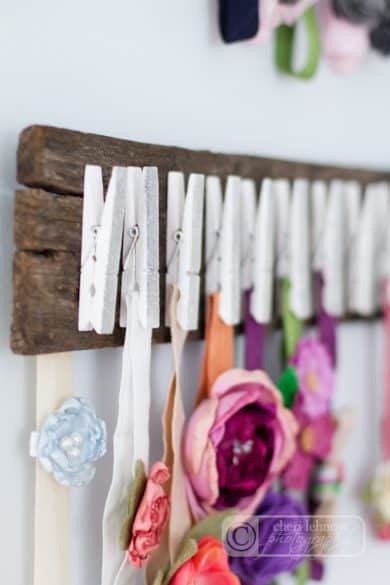 This holder uses clothespins so it works well with soft baby headbands and sports headbands. If you need a solution that keeps all your hair accessories together, including your brushes and combs, a tote bag with lots of pockets is the perfect solution. Dukes and Duchesses found these great drawers and turned them into a cute storage solution for her daughters’ hair stuff. 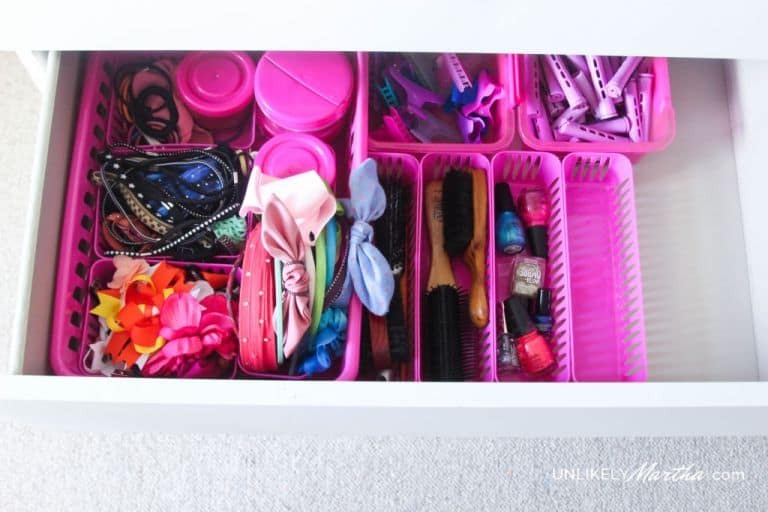 She even color-coded the drawers! 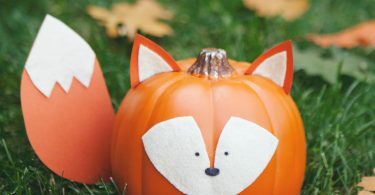 Thinking outside the box led her to a cute and unique organization system! 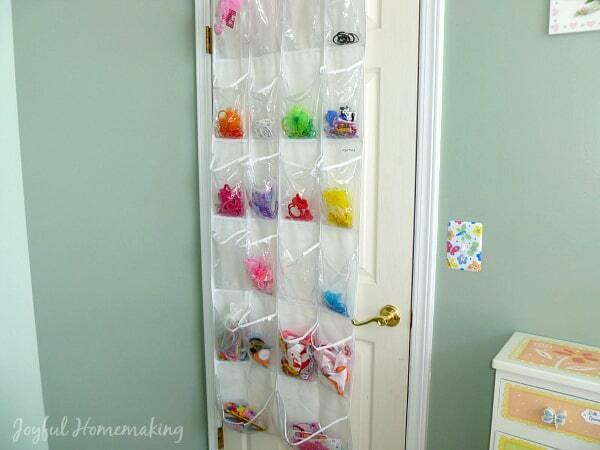 If you prefer to keep your hair accessories tucked out of the way, empty out a drawer in the bathroom and use colorful dollar store containers to keep everything organized. If you don’t have a spare drawer, grab an over the door storage holder. The clear pockets are the perfect size for storing hair stuff, plus everything is easy to see. Hopefully this list gives you some storage ideas that will work in your own home and help to keep all the hair accessories in perfect order.